The Tahltan Bear Dog was native to Canada. They were small sized dogs, about the size of a fox and light enough to run on thin-crusted snow. Despite their stature, they were bred to hunt large game such as black bears and grizzlies. Other prey included beaver, lynx, and elk. Once found they would harass the animal until their hunters arrived and made the kill with spears or arrows. 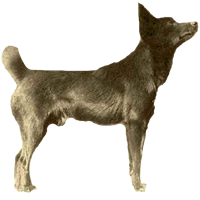 The Tahltan Bear Dog was kept by the native Tahltans in what is now British Columbia. Primarily kept to obtain bearskins for trade as the demand for skins lessened their numbers dwindled rapidly. The last known populations were in two small villages, Atlin, British Columbia and Carcross, Yukon. A large game hunter by the name of Tom Connolly used the breed in Atlin and nearby Ross River for over 30 years and upon his death in 1970 his wife Shirley was the last person to officially own the breed. It was rumored two dogs were taken to California in the early 1970s, however an extensive search by the California Rare Breed Dog Association in 1980 found no trace of them. Legend states the breed was unable to survive outside their homeland. If this were fact, it could be that the Tahltan Bear Dog could not acclimate to the warmer climates.